En cette période électorale aux Etats-Unis, les deux promotions ont pu découvrir un "biopic" sur Barack Obama, un film mêlant détails biographiques et les codes de la "rom-com" (romantic comedy). 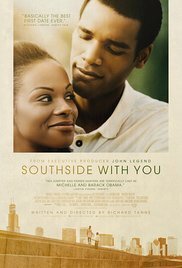 “Southside with you” is an American movie directed by Richard Danne and released in 2016. This film is a biopic about Barack Obama, the former president of the United StateS and his first date with Michelle Obama, his future wife. This movie focuses on one day only in Chicago during the summer of 1989. In this biopic we learn about the youth of Barack Obama, especially his studies and his beginnings in the professional world. Barack Obama studied/read law at the university of Colombia. After his studies, Barack Obama did an internship in the law office where Michelle Obama was working. Barack obama was the intern she was working for. Moreover, this film reminded us of the problems for black people in the world of work at the time. I found this movie a bit disappointing because it did not show his evolution in the political world. Moreover, it focused on only one day so it seemed a bit short.